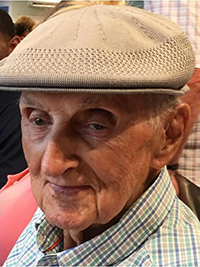 It is with sadness that we announce the passing of Mr. Benjamin Desilva, Sr., in his 91st year of “Randolph Place” 7 High Point Lane, Middle Road, Southampton SN 01. Ben leaves to cherish his memory: His beloved wife Daphne DeSilva; his children Ben Jr. [Mary], [the late] Steven W., Stephen B. [Linda], Paul S. [Mary] and Tracey M. [Sinan]. The Rosary will be prayed at 1:30 p.m. with a Mass of Resurrection Service at 2:00 p.m., St. Theresa’s Roman Catholic Church, Cedar Avenue, Hamilton, Thursday, December 27, 2018. Interment will follow at Holy Calvary R.C. Cemetery, Robert’s Avenue, Devonshire. He also leaves to cherish his memory: His eight  grandchildren – Jason [Diana], Sean [Jenny], Brandon, Christopher, Candace, Aleyna, Jennifer and Amanda; his five  great grandchildren – Chloe, Rylan, Annae’, Arianna and Anais; his sister Lorraine DeSilva, his numerous nieces, nephews and special friends. In lieu of flowers, donations can be made to St. Vincent de Paul Society, P.O. Box HM 1191, Hamilton HM EX in his memory.